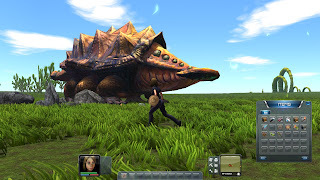 "Pathea Games is proud to announce the studio's next game, Planet Explorers. Planet Explorers is an open world voxel-based adventure rpg game set on a distant planet. The game uses a new OpenCL system based on the Unity 3D engine to allow players to change the terrain in anyway, create new objects in any form, and do it anywhere. In Planet Explorers, it is the year 2287, one of the first colony ships sent out by Earth arrives at the planet Maria, in the Epsilon Indi Star System. During its landing sequence, something appears in front of the massive ship that causes it to lose control and crash into the planet. Some of the colonists survive in lifeboats, but what they find is an unforgiving land filled with creatures ready to outlast the visitors from Earth. Now the survivors must explorer, gather, build, create, fight, and ultimately, conquer the land." Sounds like a non-cube story-based Minecraftish kind of thing; I'm going to have to keep an eye out for this one!